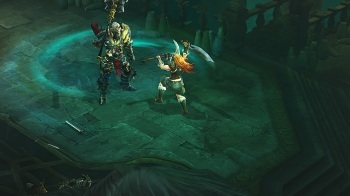 It turns out that even Blizzard thought companion pets were too cute for the world of Diablo. Blizzard's been taking a lot of flack for a while because many fans believe that it's trying to make Diablo III too adorable for its own good. Aside from the inclusion of rainbows, something that's proved controversial was the game's use of companion pets. However, Blizzard has now revealed that this feature is getting exorcised from the game because it was too darned cute. In both cases these are features we felt were underdeveloped and just not quite good enough for the game in their current state. The companion pets felt like they were mandatory to maximize play efficiency and some of the pets were too cutesy for the gritty, dark world of Sanctuary. Neither of those are issues we felt like we could solve without a lot of additional work, and we're trying to close in on a solid release date for the game, not move further away. When weighing these systems against releasing the game, we decided to cut these scrolls and stay on track for the game's release. We think we can make companion pets into a much cooler system (both mechanically and visually), and evolve the reforging scrolls into a more meaningful system at some point in the future. For the time being, they will not be in the initial release of the game. Of course, Blizzard's got a record for getting rid of stuff that just won't cut it, like all those Heaven levels we learned about last year. It certainly sounds like nixing the companion pets was the right thing to do.